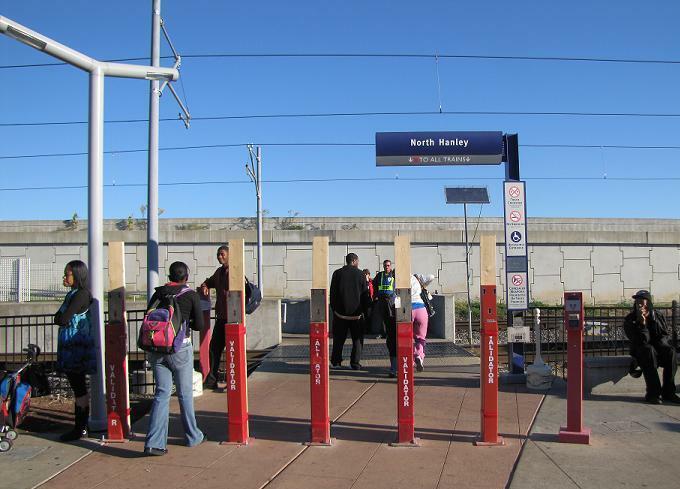 Starting last week, Metro has been busy testing two new features for the MetroLink system: between-car-barriers and smart card validators. 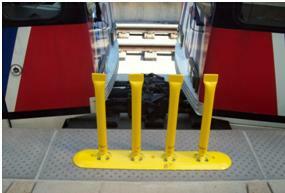 The new safety barrier helps prevent passengers from accidentally stepping between coupled rail cars. This platform-mounted system is a temporary installation. Several other safety barrier systems are being considered as well. The between-car-barriers will be effective at noon on Tuesday, October 5 at the Brentwood/I-64 station. The barriers are spring loaded so a wheelchair could roll over them in an emergency. Metro is also testing placement options for new validation machines that will become part of the new Smart Card technology we will begin to deploy in late 2012 or 2013. Five non-operational machines are currently to the left of the current validator at the North Hanley Metro Transit Center. They were installed on Thursday and will be in place for several days. Part of the spacing includes enough room so that a wheelchair or mobility device could maneuver through. Have you seen the new barriers up at Brentwood or North Hanley? What do you think? What exactly is the “Smart Card” technology? Is the idea just that your ticket would be validated just by walking on to the platform? It’s a system of “tapping” cards against a barrier system to automatically deduct/validate your pass from your smart card. Similar to the Toronto, Canada system. You can read all about the program on a previous blog post on smart cards. Is it necessary to have so many validators so closely spaced for a swipe and go system? Would not 3, maybe 4, validators be more than enough? Five definitely seems overkill for the space shown. Then again, I assume everyone will be required to swipe with the smart cards whereas, today, riders with passes just walk on through. Yes, the idea is that everyone would swipe the smart card system, including pass holders. The cards would be refillable online, automatically renew, and other benefits. The barrier system makes a loud noise when activated, and also alerts security when someone passes through without tapping the barrier. Will it matter which validator people use, as in the one on the left or the one on the right? The one on the left is operational. The others are functioning as barriers for placement testing. Hi Courtney! A quick question regarding the Between-the-Car barriers — have their been instances of people getting hurt that we (or maybe just I) haven’t heard about? I certainly understand trying to enhance safety, but this just seems to be overkill, IMO. DOH – need edit button. “their” should have been “there”. When I first heard about Metrolink installing between-car barriers, I thought Metro was referring to the type of chain-like or gate-like structures that are used to connect between train cars, similar to the types used between train cars in Chicago, DC, Philly or NY. Hello! Yes, they are considered necessary, for visually impaired passengers’ safety. This is an investigation, so we’ll be paying attention to safety issues. And, they are spring loaded, so can be stepped through or rolled over in an emergency. Between-car barriers – unless the trains always stop at the same spot, this prototype seems to cause more problems than it solves – it’s not long enough for the normal variation in stop points, and since there’s 8″-12″ between the barrier and the edge of the platform, there’s a real possibility for someone to be trapped between the barrier and the train (as it arrives or departs), even if it is spring loaded. Probably better to devise a vehicle-mounted system than a platform-mounted one. moderator – that last one didn’t post well – you delkete all the @@@@@’s . . .
I’ll pass along your comments Jimmy. Thanks! It shows up correctly in the email alert. I’ll pass that along to the projects’ team. As I also mentioned in my previous comment, I agree with Jimmy Z regarding the type of between-car barriers which could be used between Metrolink trains. I think the type mounted on the vehicles would be more preactical. Train operators would not have to deal with the burden of positioning trains in order to align them with barriers mounted on station platforms, which could increase the dwelling time of trains at the stations. I have yet to see the between-car barriers, so I’ll refrain from making an opinion, good or bad. As a bike rider who aims for the ‘center ends’ of the cars, this ‘landmark’ would help me figure out how far down the platform to go with my bike. So that’s a plus. I don’t like the validators idea… Why do you need so many of them? I’ve NEVER seen a long line behind the single validators we currently have. Plus: They’re too close together. It reminds me of the cattle shoots at an amusement park… NOT the ‘open’ atmosphere of the current Metrolink. I’m a monthly pass holder, and like the fact that I don’t have to pull my pass out of the holder all the time. I have no facts to back it up, but of all the rides I’ve taken over the years, I’ve only seen a couple tickets issued for people who didn’t have a pass when checked. My hunch is that the problem of ‘free riders’ isn’t as large as you think it is. Mark, the smart card technology to be used will not require to pull your pass out of the holder. The signal between the card and validator is strong enough that just getting within 1/2 inch of the validator will register the card. so, your pass can stay in the holder or possibly your wallet and you should still be fine. I have bene told that in London, they market and sell special shirts/jackets that have a sleeve pocket to keep your smart card in. Users just put thier wrists up to the validators!